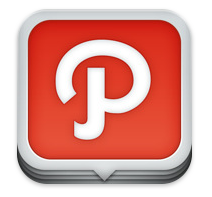 Path launched two weeks ago with a swell of buzz. Then came the backlash. It was swift and merciless. “It’s a social app that discourages large-scale social sharing — WTF?,” seemed to be the main complaint. Well, love it or hate it, Path is sticking to its, yes, path. But an update tonight brings a few nice updates. First and foremost, you can finally use pictures taken outside of the app. Previously, you could only load up the app, hit the camera button, and take a picture to share on the service on the spot. The reason for this was that they wanted to make sure your path was being shared in realtime from where you really were. But the latest version of the app, 1.0.2, has a new “Library” button in the camera area. Hitting this allows you to pick any photo from your camera album. But read that carefully — it has to be from your camera album. In other words the picture still has to be one taken with your iPhone camera. Again, there’s a reason for this. If you choose to upload one of your camera album pictures to Path, it looks to see where that picture was geotagged and what time it was taken. If you try to tag it to a place in Path, you’ll notice that the venues listed are those near where the picture was taken, not where you are at the time of the upload. Also, the picture is then inserted into your Path stream corresponding to when it was taken, not necessarily as the newest picture. Again, the idea seems to be to keep your path accurate. This allows you to take all the pictures you want with your iPhone camera and upload them to Path later, while keeping your path intact. It’s an interesting solution. Other updates in the latest app include revamped profile pages, which make it easier to stop sharing with someone or to pause them. And it’s also now slightly easier to find other Path users to share with. One thing still not included is a way to share to other social networks. And yes, the 50 friend limit is still in place. Again, Path is sticking to its path. You can find Path here in the App Store.